To draw you into the page and help the recording come to life, there is some text about the history of the song. To enable interaction by remixing, there is a MIDI version, the recording length is given (which helps people looking for background music), the recording is under a license which permits remixing, and there is an offer to relicense if necessary. To enable interaction by playing it for yourself, there is sheet music and guitar tablature as both a downloadable PDF and an embedded image. To handle limited attention spans, I crammed as much fun stuff as I could manage into the first screenful above the fold. Video gets prominent real estate, because that draws people in like nothing else. To make the MP3 playable in-place I included Yahoo! Media Player. To optimize placement in search engine results, the page has a good clean URL (http://soupgreens.com/froginthewell/) and the song title is in the page header. There is sheet music inline in the document in addition to the downloadable PDF. This is to inspire people who play an instrument to try it out. In the downloadable PDF there is a (text) link back to the site. This is to improve the stickiness of the content — if anybody does print it out and read through it on their instrument and then doesn’t get to know the main site, I must have really messed something up. Also, I’m planning to give out printouts at shows and getting people to follow the link back to the site is the payoff. Here’s the link again: Frog in the Well. In a world where only models had their picture taken and only supermodels had their picture looked at you’d be all fucked up about faces. remix culture [was vital] was in the era before recording technology. Remixes back then required transcriptions and new performances of the pieces created, to make new pieces. Transcription/remix culture provides a set of parallels that might help us understand that what we are doing is not some odd form of new piracy, but instead a licensed continuation of a tradition that made sense and great music. Liszt at 20 heard Paganini, then 50, perform. He was so swept away that he began to convert Pagainin’s violin studies into piano pieces. His remix (technically a transcription) of Paganini’s “A minor caprice (Nr. 24)” for piano both caused him controversy in his time and gives us a sense of his piano genius in our time. Transcribing a violin piece for piano is like translating a poem. There would be some mechanical conversions, but also there would be spots that required the transcriber to get involved with the music at a qualitative level. The transcriber would need to understand the internal lines and structures, and since structures carry meaning they’re subjective enough that the transcriber would have to exercise their own taste and musicality. It would be a lot like orchestrating, arranging, or remixing. Mr. ORVILLE HATCH, of Franklin, Conn., has become insane, he having devoted considerable attention to the subject of Spirit Rappings. Mr. HATCH is a farmer, and has been instrumental in introducing many important improvements in agriculture into the town in which he resides. 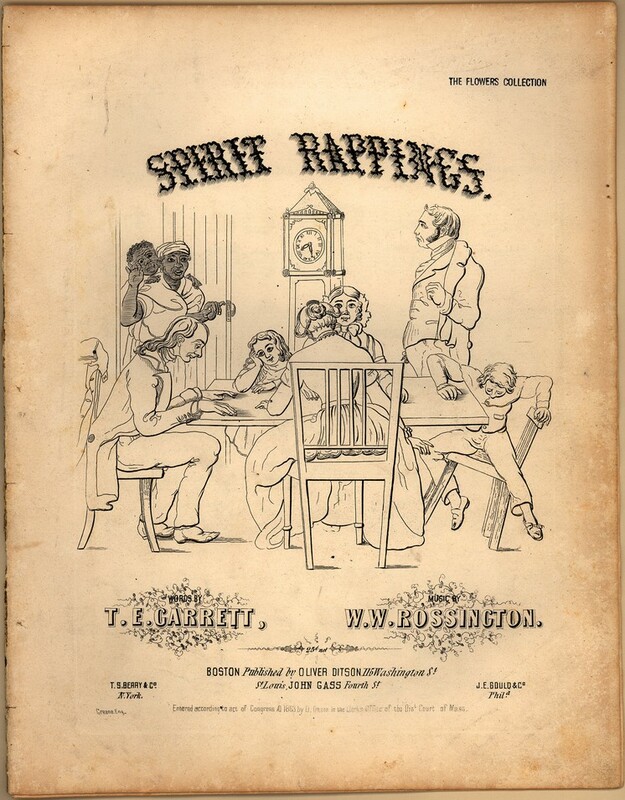 Madame Pamita, whose performances involve both spiritualism and really old American music, sent me a pointer to sheet music for an 1854 tune called “Spirit Rappings”, presumably because it’s a great number for Halloween. This post is my version of it. Since I did a vocal part for once, the mix has the guitar and vocal parts hard panned to left and right so you can pull out the singing and do karaoke. This recording is under a Creative Commons ShareAlike-Attribution 2.0 license. See also my boilerplate copyright statement. 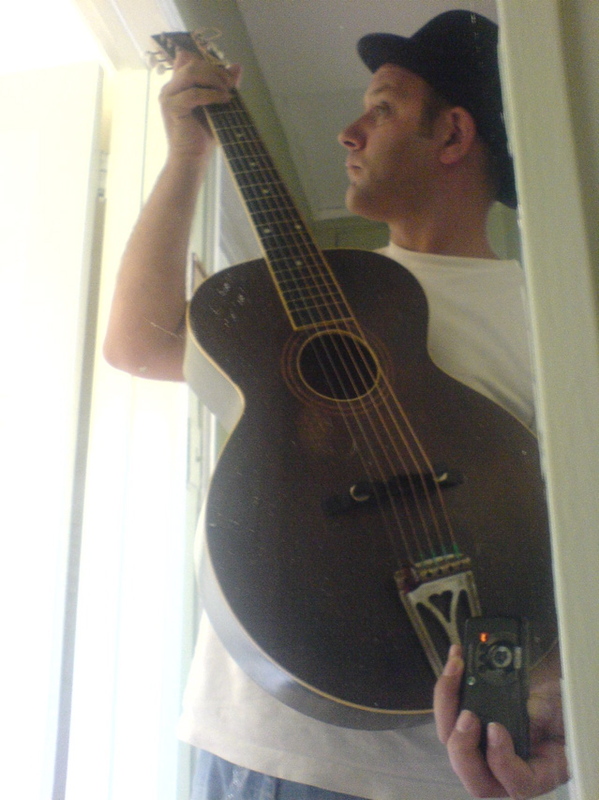 I picked up a parlor guitar dating from the 1890s. It is in completely playable condition, even though it’s on the order of 120 years old. The price was $750, which is incredible given that an electric from the 1960s goes for a couple thousand. The plan is to incorporate this into my live set, along with my electric guitar and my 1920s L3. The music for the set ranges from 1800-1900. All together these materials will tell a story about the early development of American music and the prehistory of blues, jazz, country and rock. See the entire photoset for a detailed look. This post is a recording of a fast and furious guitar performance of a fiddle tune called “Kiss My Lady” which was transcribed in 1800 (or so) by a ship’s musician named William Litten. Musically I wanted something energetic and raw. I didn’t care about mistakes except if they were bad enough to really mar the listening. The final performance definitely has mistakes, and both my dogs got into the action by barking.It usually takes me a lot of takes to get something with the right feel and no fatal mistakes. In this case I did a few takes a day for a few days before I got one I liked. I don’t have sheet music for this because I got it from a book which is not online. Here’s the story.Litten was employed as a ship’s musician, and along the way he wrote down a lot of music. I think that this was more like a notebook to aid his memory than a book for the public. His manuscript was brought home to Martha’s Vineyard, an island off the coast of Massachusetts, by a local guy named Allen Coffin. The Martha’s Vineyard economy was based on fishing, sailing, etc, until it became a touristy beach destination in the late 20th century, and Coffin was probably on the ship with Litten. The manuscript ended up in the library of the historical society in Edgartown, the biggest town on the island. In the 1970s a musicologist named Gail Huntington copied it into more readable notation, made some corrections and other tidying up, cross-referenced the songs in contemporaneous publications, and eventually published it. Her publication is copyright 1977 by Hines Point Publishers, Vineyard Haven, Massachusetts 02568. This was either self-publishing or a very small-time operation. William Litten was a ship’s fiddler in Royal Navy in the first years of the nineteenth century. What makes Litten remarkable amongst his peers was his ability to transcribe music. In the years 1800 to 1802 he was aboard the HMS Gorgon, leaving England in May 1800, arriving in China in February 1801 and passing through St Helena in 1802. During the voyage he wrote down much of his repertoire, thus giving us a unique snapshot of the musical and, in particular, the fiddle repertoire of his time. The original and now unprocurable book was assembled and published in 1977. Extensive searches failed to find the publishers. The book was reproduced from a copy on interlibrary loan from New Mexico for the purposes of study at a a workshop at the National Folk Festival in Canberra in 2006. A few copies remain and are offered here. The copyright situation of the sheet music is messy. Huntington’s substantive contributions to the original entitle her to a copyright on her contributions. However figuring out what is a copyrighted addition and what is a public domain part of the original is totally up in the air. Since she and her publisher seem to have disappeared, this has turned into an orphaned work. The good news is that a public domain performance of the underlying composition and arrangement is completely legal as far as I can tell. My own copyrights in these recordings are released under the terms of the Creative Commons Attribution-ShareAlike 3.0 license per my boilerplate licensing statement. This post is a recording of the composition Ella Waltz by D.E. Jannon, which was published in 1854. It is the third of a set of three waltzes by D.E. Jannon. I have also blogged recordings of Amy Waltz and Carrie Waltz. I don’t consider the series finished because I want to redo the Amy one, but who knows whether I’ll really come up with a better version in the end. It takes a ton of practice and a lot of trial and error with the arrangement to make one of these recordings, and I have other tunes that I want to move on to. As I was learning the 3 waltzes I made up a back story for them. In my imagination they are named after D.E. Jannon’s three daughters. They are ordered from oldest to youngest. Amy is a teenager, Ella is a little kid, Carrie is in-between. Amy is going through a phase where she is hustling all the time and in a hurry to get away from her parents. Ella has been falling down, dropping things, running into stuff, and generally being accident prone. Carrie is moderate in all things. The original writing on this tune had dead spots, places where the writing was thin or weak and needed fixing, so I rewrote many of the parts. My version isn’t as simple as the original, which is a loss, but it sounds better. By the way, I got the name of this tune slightly wrong while I was working, and even though I corrected it in the end some of the metadata and file names are wrong. Right: Ella. Wrong: Emma. These recordings are released under the terms of the Creative Commons Attribution-ShareAlike 3.0 license per my boilerplate licensing statement. This post is a short, jittery, very loose, and slightly overdriven acoustic guitar version of a tune called “Anna Waltz” which was composed by a guy named D.E. Jannon and published in 1854. I learned it from sheet music at the Library of Congress web site. This recording is under a Creative Commons BY-SA license per my standard license statement. 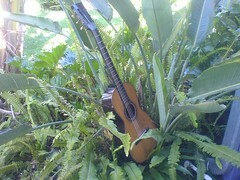 This post is one of my acoustic guitar recordings. It is a tune called “Carrie Waltz” which was composed by a guy named D.E. Jannon and published in 1854. I learned it from sheet music at the Library of Congress web site. I’m only publishing an MP3, not an Ogg anything or a lossless version or the Audacity original. And I didn’t pay any attention to the tagging process, so it might or might not have reasonable metadata and proper Creative Commons licensing in the ID3 tags. It takes forever to get all these details right and I want to see how it feels to focus on the tunes and not worry about the computer maintenance.